Heat oven to 325°F. Spray six 6-oz. custard cups or ramekins with nonstick cooking spray. Place cups in ungreased shallow baking pan. Stack bacon slices. With kitchen scissors or knife, make several 1/2-inch slits around outside edge of bacon. Ease 1 bacon slice into each sprayed custard cup, allowing slit edges to overlap to fit into cup. Break 1 egg into each cup. Top each with 1 teaspoon half-and-half. Sprinkle each with dash salt and pepper. Bake at 325°F. for 22 to 25 minutes or until egg yolks are thoroughly cooked. About 10 minutes before eggs are done, prepare sauce. In small saucepan, combine butter, water and 1/8 teaspoon salt. Bring to a boil over medium heat. Remove saucepan from heat. In small cup or bowl, beat egg yolks. Slowly blend small amount of hot liquid into egg yolks. Return yolk mixture to saucepan; cook and stir over low heat just until thickened. Remove from heat. Stir in lemon juice. To keep warm, set saucepan in larger pan of hot water. To serve, place muffin halves on serving plates. Carefully slide bacon-egg cup onto each muffin half. Top each with scant 2 tablespoons sauce. Canadian bacon squares can be used for this recipe; just tuck in the corners so they do not overcook. If the bacon is cut thin and 6 ounces yields more than 6 slices, cut the extra slices into pieces and divide them among the cups, placing pieces in the bottom before adding the eggs. When making hollandaise sauce, use low heat so the sauce does not boil once the egg yolks are added. 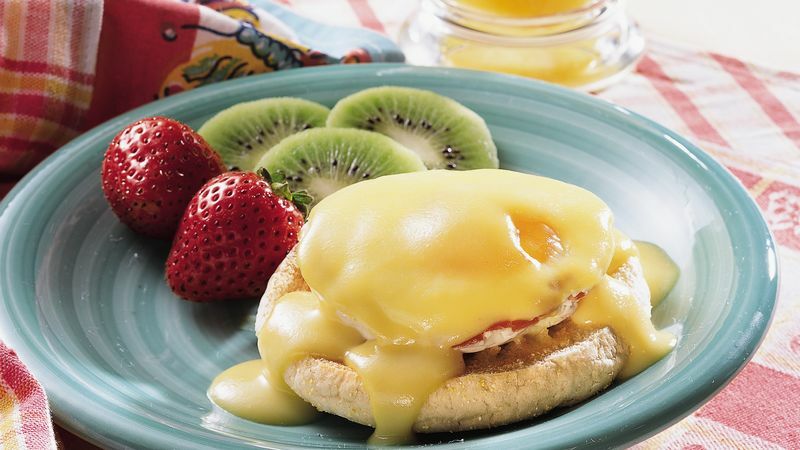 When set in a pan of hot water, the hollandaise sauce keeps warm for up to 30 minutes. Serve this dish with fresh fruit and nut bread or coffee cake. For added color, sprinkle the top of the sauce with paprika.